I have a friend who would often say to his children when they questioned something, “…because I said so…” He felt that it did not matter what he said they should obey his command even if his own actions contradicted that edict. I have said to my children, “…because I said so…” but never felt that it was sufficient as a standalone statement and felt that due to the immediate or imperativeness of the situation explanation might not be in order and compliance was required but believe that usually a fuller explanation would be beneficial. I heard a person some time ago tell his wife, “You WILL respect me!” He felt that because he was the husband and a man he had the authority to tell her what to do, when and how to do it. He felt that if he said frog she should ask how far she should leap. If he came home he demanded that food be on the table and if he wanted a drink she should be there to respond to his beck and call. He would belittle her in public making light of something she said or did and expose her to harsh criticism. He then was stunned that she showed him no respect. He was reaping what he was sowing and if he wanted her to show him respect he needed to give respect. If he wanted her to be caring he need to demonstrate concern. He did not and received exactly what he planted. If we want people to be understanding we need to sow seeds of understanding and keep the Law of Sowing and Reaping near to our hearts. Just because you show understanding does not mean that person is going to immediately change their attitude and reciprocate but if you remember that we reap WHAT we sow, LATER than we sow and MORE than we sow you can continue planting seed for the harvest you desire. Everyone will not appreciate or reciprocate so rather than be discouraged allow the Heart of Jesus to flow through you and as my grandmother used to tell me, “kill them with kindness”. I never mastered that growing up and it is no wonder that I experienced much of what I did. She, on the other hand, was one of the kindest human beings I have ever known and people loved her dearly and respected her greatly. She was unfazed by what others did but demonstrated what was in her heart and reflected Jesus powerfully. So if you are not getting the respect you would like and people are responding negatively to you more than you would hope try to give them what you would like to receive. Begin planting seed for a harvest that will come! God bless as you go through this day! It is always fun to read in the Old Testament and find a passage that has been clearly interpreted and defined in the New either by our Lord Himself or one of the apostles. There are two prominent New Testament Principles that can find their beginnings in this passage. 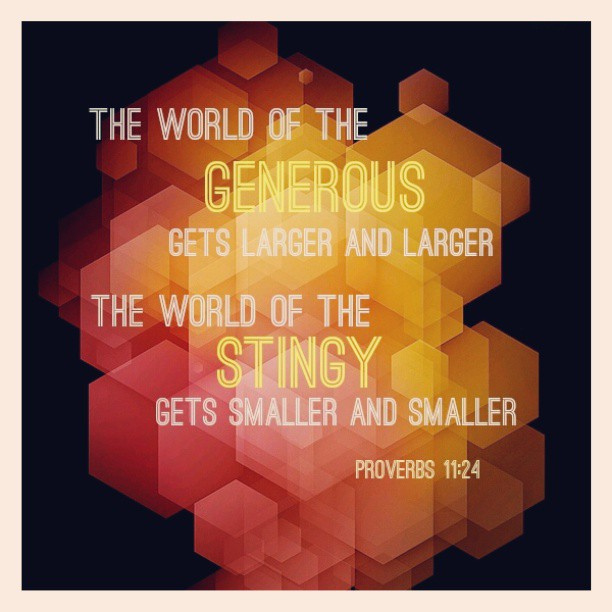 The Law of Sowing and Reaping or Reciprocity and Giving. These are explicitly addressed in the New Testament. Here the writer describes two kinds of people – Generous and the Stingy. I’ve known people who were generous to a fault and some who pinched every penny so tightly it squealed when released. The latter would sometimes give, but grudgingly and with much compulsion and urging. The writer declares that one leads to increase and the other to lack. He reveals that the generous will prosper and the wonderful truth that the one who cares for others will be cared for by others. Paul taught that God loves a cheerful giver and some have so expanded this truth to make it an investment plan to provide riches for themselves with no consideration for the motive behind the giving or the purpose for the increase. That is why some have attempted this principle became disillusioned and gave it up as a false doctrine. Purpose is as important as the gift. What is the motivation behind the gift? Is it to honor God, act in obedience or simply for person gain through the expected return? God is not interested in satisfying human greed or carnal appetites. He does what He does with purpose and it is always focused on the redemptive. We reap WHAT we sow. If we plant watermelons we will not reap cucumbers. If we plant peanuts we will not reap carrots. WHAT we sow regardless of what that is will come back whether that is money, compassion, labor, etc. We reap LATER than we sow. 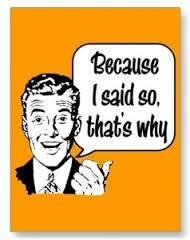 No farmer plants seed on day and expects to get up the next morning to bring in the harvest. Time is important in the process. We reap MORE than we sow. We plant a grain of corn and it produces a stalk that produces ears of corn which have multiple grains. We plant a pea and reap a stalk that produces many pods with numerous peas in them. So we reap what we sow, later than we sow and more than we sow. The principles revealed here is the same. The Law of Giving as described by Jesus reveals that WHAT we give is WHAT we get in return and the principle is advanced that the return will be WHAT we give and MORE than we give. I suggest that this principle can be immediate or over time but it will be WHAT and MORE and be directly connected to the proportion of our giving. If we give love then love will come back to us. If we give mercy then mercy will come back to us. If we give hate then hate will come back to us. If we give a helping hand then a helping hand will come back to us. As we cast our bread on the waters after many days it returns to us. When Jesus sat near the offering container and watched those who had much put in their gifts He was largely unimpressed but when the widow came and gave her all He was. He even declared that she had given more than all the others. MORE? Not in the amount but in the proportion. I like to say, “If you didn’t notice it or feel it when it left you will likely not notice or feel it when it returns.” If it had no impact on you departing it will have no impact when it returns. If you give with a teaspoon why expect a watering trough return? I know the return is MORE than the outlay but the proportion will still hold true. I pray that God inspire a spirit and heart of generosity in each of us. Blessings! Ps 150:1-6 – “Praise the LORD! Praise God in His sanctuary; Praise Him in His mighty firmament! 2 Praise Him for His mighty acts; Praise Him according to His excellent greatness! 3 Praise Him with the sound of the trumpet; Praise Him with the lute and harp! 4 Praise Him with the timbrel and dance; Praise Him with stringed instruments and flutes! 5 Praise Him with loud cymbals; Praise Him with clashing cymbals! 6 Let everything that has breath praise the LORD. Revelation 5:5 – “The Lion of the Tribe of Judah, the Root of David, hath prevailed to open the book, and to loose the seven seals thereof. Jesus came from the Tribe of Praise! Another side note is that in the travels of Israel in the Wilderness as described in Numbers 2:2-3, Judah was placed on the East side facing the rising sun and the only entrance into the tabernacle enclosure. You can’t get in without going through Praise! It is the person of praise that catches the first glimpse of the “Son of Righteousness” (Malachi 3:2). It is the one who is engaged in Praise that has his/her face to the SON! What does praise do? It is a God-given garment to ward off the spirit of heaviness as seen in Isaiah 61:1-3. No medicine will cure the ill of discouragement like praise. Depression cannot live in the heart that has learned the truth of and practices Praise! Praise sets the heart at liberty like nothing else. Praise causes us to be conscious of the Presence of God mentally, emotionally, physically and spiritually. God’s Presence makes me conscious of His Person. Jesus, our Master, Counselor, Might God, Everlasting Father, Prince of Peace, and Son of Man, Son of God, Divine Creator, Deliverer, Lover and our Encouragement. He is our ALL IN ALL. 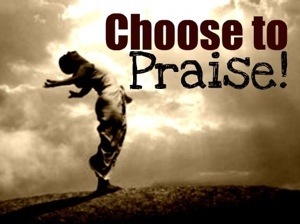 Praise causes one to focus on God and become conscious of Him. As we see His person we are directed to His will and plan and as we see His power we receive confidence to depend on and trust Him completely. The more we Praise and Magnify Him, the more we become conscious of Him and the more aware we are of Who He is, the Fact that He is, What He can do and is doing. Praise is the entryway into His miraculous deliverance in a very real way. Psalm 50:23 – “He who sacrifices thank offerings honors Me, and he prepares the way so that I may show Him my salvation.” Praise infuses God’s strength into our situation and exposes us fully to God like nothing else we can do. Praise may be sacrificial initially and then become like an artesian well. May God enable you to enter into His Presence and learn to Praise! Blessings! As Jesus was instructing those who believed He told them that if they abide in His word they would be His disciples and then in John 8:32 He declared, “And you shall know the truth, and the truth shall make you free.” When truth is heard, heeded and applied there is freedom! I am convinced that when a believer understands what Praise is all about they will become participants in that activity in and out of church gatherings. I am 100% convinced that Praise is the Setting for Revelation. As I examine the Revelation of John I see a man exiled, afflicted, seemingly defeated, embattled and in great need of comfort and consolation. It is here that he not only received Revelation but Revival. He is resuscitated by a heavenly experience in which God gives him the key to refreshing, refueling and rescue. The thing that you and I need to fully understand is that John is in the Throne Room in the presence of the ALMIGHTY GOD, the God of all creation! God’s presence not only elicits praise but is the source of praise. 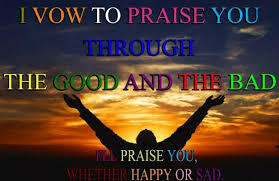 Praise is where God resides! Praise is His permanent residence! Time and space has once again run short so we must hit the pause button and wait until next time to continue. Until then may God so permeate your person that His presence is known powerfully and in a most liberating manner. God bless! Psalm 150:1-6 – “Praise the LORD! 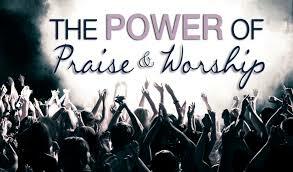 I know the beauty of praise and worship and the power it affords in defeating the enemy, opening our spiritual eyes and enabling us to find LIBERTY like we have not known. Paul informed us that where the Spirit of the Lord there is liberty. (2 Corinthians 3:17) I believe that praise and worship are tools, weapons and activities that liberates. I have long told people that if they need a quick pick me up head to the Book of Psalms for it is a book of praise, adoration and worship. As I read this injunction in Psalm 150 I am overwhelmed with its simplicity and power. The more I examine the Holy Writ the more I discover that Praise is a key component in both Testaments and has been a substantial factor in every revival of Church history and is among the first practices to stagnate in time of decline. God is Alive and Active. We are Indwelt by Deity. Through Him we can Pull Down Strongholds. Through Him we are More Than Conquerors. When there is genuine praise and worship present in congregational gatherings and individual hearts excitement rises and there is more realized victory in the lives of believers. Churches become places of victory and people experience refreshing, refueling and are rescued. I fully understand there is much difference of opinion on many matters of doctrine and while we do not agree on everything we should agree on one thing – HE IS WORTHY TO BE PRAISED! When I examine the record in Revelation I find that in Revelation 4 there is an outbreak of Praise & Worship. In Revelation 5 there is a sequel to that outburst and yet another in Revelation 11. Then in Revelation 19 we find the great multitude erupting in praise & worship. It would be impossible to conclude that heaven is not a glorious place and filled with praise unto our God! I am convinced through study and experience that Praise enhances everything we do. In fact, there is nothing we can do more therapeutic than Praise. There is nothing man can do that results in more healing physically, mentally, emotionally and spiritually. It is a liberating activity designed by God not because He is self-absorbed and narcissistic but because He knows the value it affords us, His children. It is impossible to force people to Praise and when one experiences God and the power of this activity it is virtually impossible to prevent them from Praise. Time will not permit me digging deeper but I want to press on next time so until then may God fill your day as He guards and guides your steps. Blessings upon you and your day! 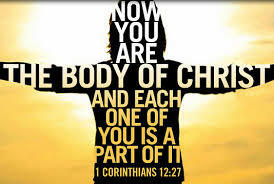 1 Corinthians 12:20-31 – “But now indeed there are many members, yet one body. 21 And the eye cannot say to the hand, “I have no need of you”; nor again the head to the feet, “I have no need of you.” 22 No, much rather, those members of the body which seem to be weaker are necessary. 23 And those members of the body which we think to be less honorable, on these we bestow greater honor; and our unpresentable parts have greater modesty, 24 but our presentable parts have no need. But God composed the body, having given greater honor to that part which lacks it, 25 that there should be no schism in the body, but that the members should have the same care for one another. 26 And if one member suffers, all the members suffer with it; or if one member is honored, all the members rejoice with it. Before I accepted Jesus as my Savior the girl I was dating and I were in riding with my parents and I told her, “I don’t know why but I have a feeling I’m supposed to be a preacher.” She said, “Well do it.” My response was simple, “You have to be kidding who would listen?” I and she knew how I was living and the last thought on anyone’s mind would have ever thought of Roy the Preacher. They might have thought Roy needs a preacher but never is a preacher. I grew up in a rural church but did not know the LORD. After I accepted the Jesus as my Savior and begin to feel the tug to ministry I resisted and gave every argument I could think of as to why that was a bad idea and sought to dismiss it. I even told my pastor that I was going to pursue teaching and Christian counseling for that was a great need which with the proper training I could see myself addressing. He just smiled and said nothing. It was as if he knew inside that I was simply kicking against the pricks and in time would come around to what God truly wanted. I did not want to be out front for I considered that too weighty a responsibility. Throughout my short life I found that I was often pressed into a leadership role but I considered the call to preach incredibly frightening. I resisted speaking publicly and even when my English teacher in high school continually pleaded with me to join in drama and speaking I resisted. Most don’t believe it but I was shy and standing in front of people was so uncomfortable I wanted no part of it. In my early Christian experience I sought to be in the shadows doing tasks that no one wanted to do and assuming roles that others considered beneath them. God would have none of that and through a series of events that were undeniable, He impressed upon me that my call was to preach and when I opened my heart to that He opened the doors of opportunity. Too many want to be the Body Part in Christ that is visible and praised as important. Many want to be the apostle, prophet, evangelist, pastor or teacher being seen. We want to be the comely parts but nobody wants to be the little toe. The human body needs all its members to function in harmony and each part is important to the overall function of that body and the same is true in the Body of Christ. Every human body has a head and every human body has arm pits and while I am not calling any role in the Body of Christ “Arm Pit Ministry” consider the truth of that image. I have observed people self-label themselves as apostles, prophets, etc. If you are something you will function in that gift and calling and you will have to tell no one that you have a particular ministry gift, they will know it for God will make it known through your function. Therefore, rather than striving to be the part that is recognized and praised desire to be what God wants you to do and you may function in a little known, observed or appreciated role for a time and in your faithfulness God will promote you to a larger role. Not necessarily more important but more visible and with more responsibility. If God does not open the door or has not ordained you function in that role you will fail and likely do more harm than good so BE WHO HE HAS CALLED YOU TO BE and REJOICE in that call. Everybody cannot ride the horse some have to shovel the manure. God bless you richly as you go through this day! Psalm 19:1-6 – “The heavens declare the glory of God; and the firmament shows His handiwork. 2 Day unto day utters speech, and night unto night reveals knowledge. 3 There is no speech nor language where their voice is not heard. 4 Their line has gone out through all the earth, and their words to the end of the world. 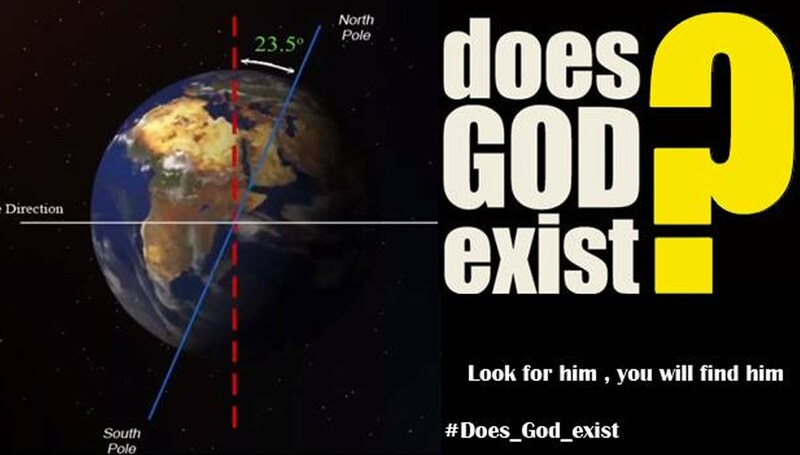 I have been asked more than once to give someone proof of God’s existence and although I have always been tempted to say, “Give me proof that He does not” but I resist and refer to both scripture and creation to demonstrate His existence. Here in this Psalm David uses creation as a beautiful picture of the existence of God. As I read his words I sense something of the awe that he held toward our Creator and His creation. When I watch a sunset or sunrise I am always awed by what God has done and wonder how anyone could truly believe this just happened. I could no more view God’s canvas of creation and think it was random chance than I could go to an art gallery and think those masterpieces just happened without the labors of the painter. I could no more view creation than I could go into an automobile museum and view the classics of the automobile word and believe that a bunch of metal and parts somehow just randomly assembled themselves without the designer and technicians labors. When I view a newborn baby in the arms of its mother I see the work of creation. When I look at a slug crawling on the wall I do not picture in my mind that in eons to come that slug will evolve into a human being. When I observe the perfection of God’s creation giving us night and day, sunrise and sunset I am awed by the majesty of what God has done. Consider the absolute perfection of our earth’s distance from the sun, the orbit and axis of the earth and tell me that was random chance. When I study the intricacies of the human body with its network of nerves, veins, arteries, organs and how it operates to believe that evolved from a single cell in the eons past is more than I can fathom. I know it is a cliché that some reject but “Design does imply a designer” and there is design in God’s creation. Can I explain God? Not adequately, but I can believe in Him, experience Him, be led by Him and fellowship with Him. I know what my life was like before that eventful night that I truly believed, repented and accepted His offer of salvation. I know what my life was like after that night and it is not my testimony alone that verifies that but that of those who knew me before and knew me afterward. I became a new creation and without God how do I explain that? I have experienced divine healing in my body including being healed of Parathyroid cancer, broken bones and experienced incredible miracles in my life and without God I cannot explain those. My proof of God’s existence is not only in His word, in His creation but in my heart and life. I have experienced Him so trying to persuade me from believing in Him is futile. For I know whom I have believed and am persuaded that He is able to keep that which I have committed to Him against that day! God is alive and loves you dearly. May God be with you as you go through your day!